No, this title is not referring to the roaming photographers. It is about the photos of antiques taken by this roaming photographer (who is not quite yet an antique). Pat and I went out last week not quite sure where our day would take us. But after some shots of hay bales and rusted antique farm equipment we found ourselves just west of Jonesville on route 12 in the middle of a lot of antique stores. One store claimed it was the largest antique store in Michigan. We decided to spend some time in three of the stores (including the super-sized one). We saw many fascinating things, but, even though we did see some genuine antiques, I learned that one person’s “antique” might be someone else’s discount yard sale item. Pat put up pictures of the antique hats she captured (http://imissmetoo.me/ ). I found myself focusing on contrasts in many of my pictures. These four will give you some idea of my efforts. The first picture was taken outside of a store. 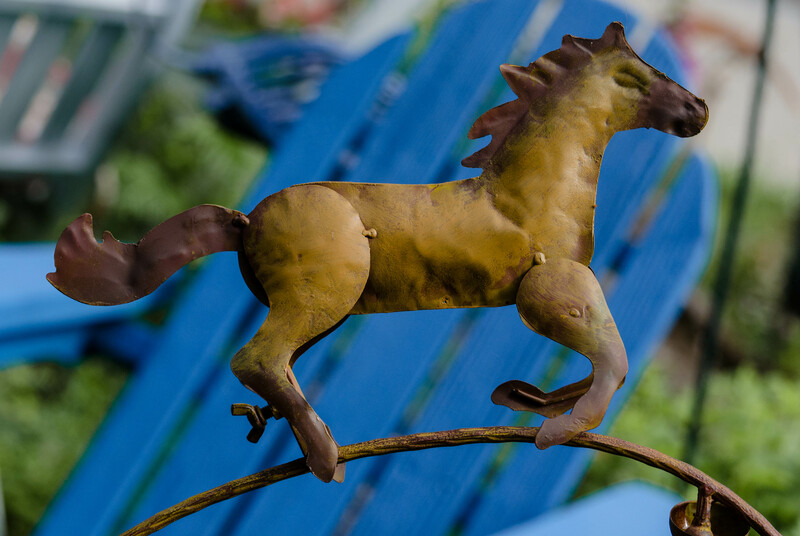 I liked the contrast of the lawn ornament horse with the blue Adirondack chair. The next two pictures took advantage of the fluorescent lighting bouncing off of the corrugated metal ceiling. The drama of the photo of the pitcher was elevated by the fact that the pitcher was on a high shelf. 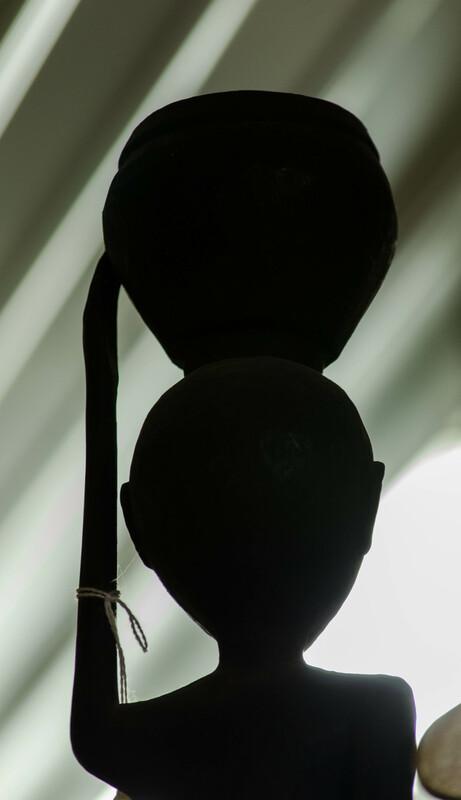 The silhouette of the woman carrying water on her head was from a hand-carved statue from Africa. The last picture is from the base of a lamp that was lit from inside. 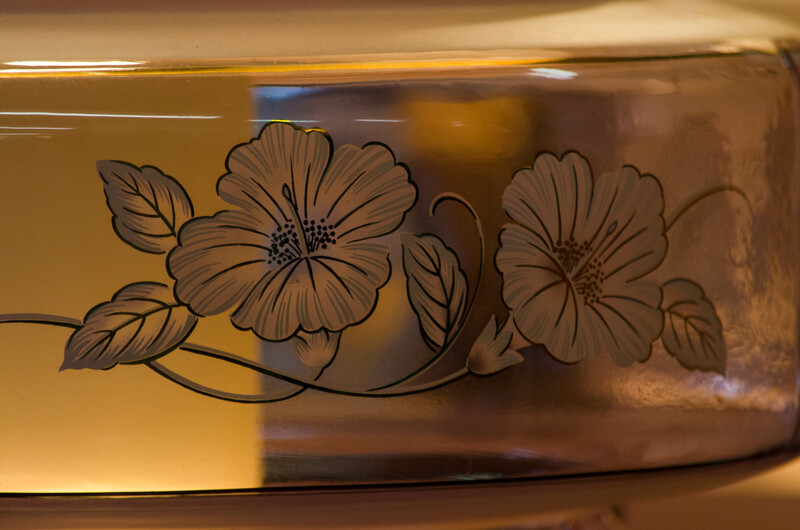 The etched flowers are enhanced by the soft light of the lamp and the reflections of the surrounding treasures. Fun images, Julie. I like the first one best.